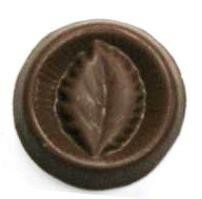 Custom molded solid chocolate candy small round leaf, foil wrapped with imprinted label applied to foil. Product also available in cello bag tied with ribbon for an additional $0.86 (R). Makes a great food gift or fall autumn nature promotional giveaway. TURNAROUND TIME Personalized Products : 5-7 business days plus shipping time. For personalized products, Artwork Proof will be emailed within 2 business days for your approval. Standard products : 3-4 business days plus shipping time. NEED IT FASTER ? Please call 1-866-446-4040 to arrange for a RUSH ORDER. 5-7 business days after artwork proof approval plus shipping time. Artwork proof will be emailed witing 2 business days for your approval. 2-3 business days plus shipping time. Please call 1-866-400-2199 to arrange for a RUSH ORDER.